If you meet someone collecting signatures for 'Nevadans' for Background Checks, ask them the following questions. But remember that most signature gatherers are paid by the signature and will lie or say anything to get a signature, so take their word with a grain of salt. How will background checks reduce crime when criminals do not obey the law to begin with? How will this law detect people who sell guns without a background check? How will infringing on the 2nd and 4th Amendments reduce crime? Why do you want to make difficult for law abiding citizens hard to exercise their rights? Who is Nevadans for Background Checks? About how many guns are sold in face-to-face transactions? About 10 percent. How do most criminals get their guns? Theft, straw purchases, and illegal street deals. About many people were convicted of a gun violation after failing a background check? 44. Silencer Co. has made this nice graphic explaining how silencers work and that they are indeed legal. Source is unknown, I found it on the internet somewhere some time ago. Recently, I was asked for recommendation for guns and ammo. Well, here goes. These are my own personal recommendations based on my own experiences only. For recommendations for shooting and concealed weapon permit instructors, please email me. 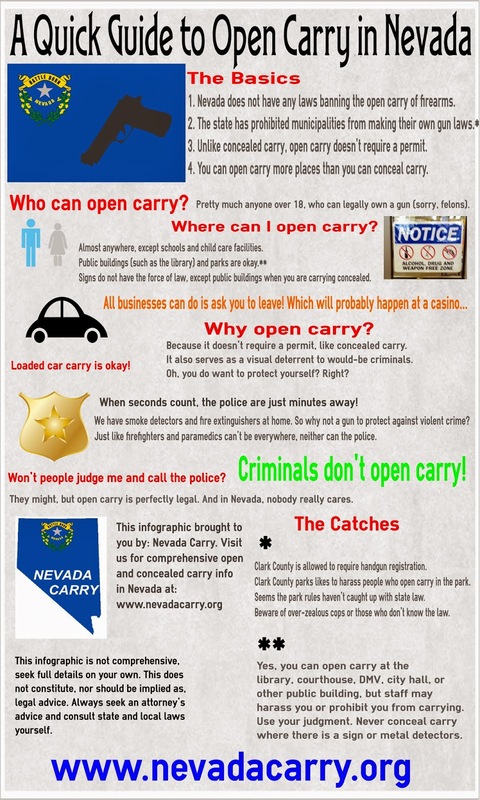 Nevada Carry also conducts non-mandatory open carry training and familiarization sessions.Email for details. In this article, the NRA debunks the three most popular myths regarding the 2nd Amendment. Myth #1: You have to have a license to operate a car. Why shouldn’t you have to have one to own a gun? Myth #2: The Second Amendment specifies that owning a gun is only for serving in “a Well-regulated militia”—what we now call the National Guard. Nevada Carry, an organization and website dedicated to promoting the right to safe and legal open and concealed carry of firearms in Nevada, would like to publicly support Kroger in its recent decision to trust their customers to carry firearms responsible when shopping. Kroger has ignored the unreasonable demand by a small, but vocal anti-2nd Amendment group backed by wealthy donors and interest groups. It is clear that this interest group does not represent the will of the majority of Americans, and by spending money, seeks to promote the false notion that the longer American tradition of keeping and bearing arms is on the decline. Rather, support by average Americans for their 2nd Amendment rights has never been stronger. It is deplorable that this group, which has less influence than it does money and an abundance of emotionally charged and fallacious advertising, seeks to force Kroger to meet their demands through force of humiliation. This group would prefer defenseless citizens, disseminates propaganda, and attempts to crush all opposition. Nevada Carry supports Kroger in refusing to compromise with this organization that is short on facts, high on emotion, and engages in bully tactics to make Americans less safe and deprive them of their rights. Every business that ignores the taunts of a bully deserves our money.